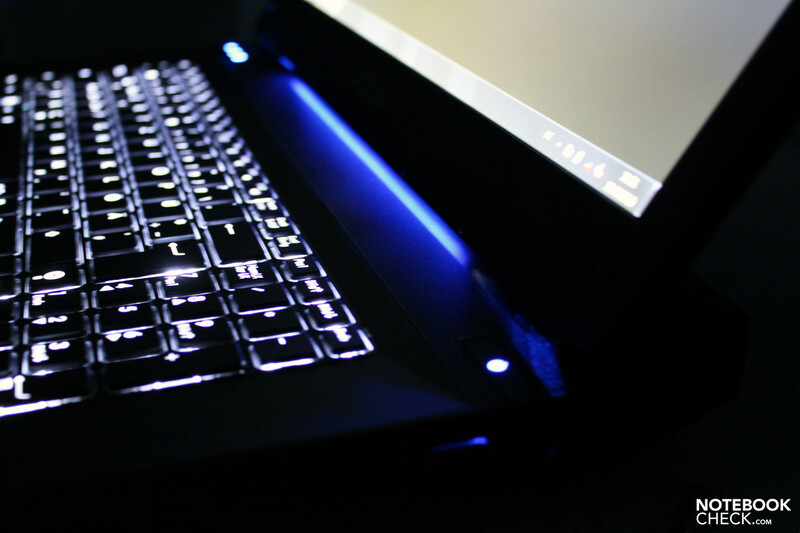 The G73 already let the hearts of the notebook gaming community beat faster in its first available alternative. 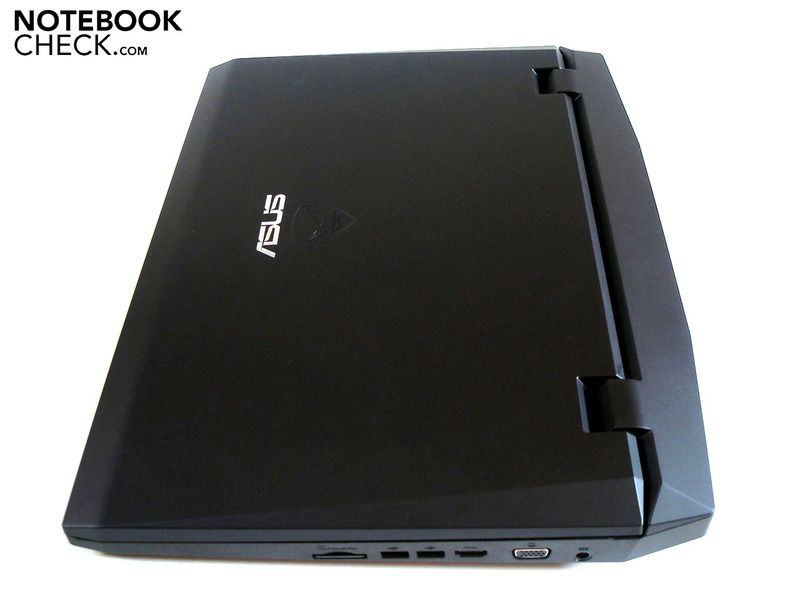 Asus has now upgraded it and equips the machine with an i7 quad-core CPU, 8 GB RAM, a mass memory of 1TB and a FullHD display. Currently, nine different models are listed at notorious price comparisons for the European market. You can take delight in the Intel i7-720QM quad-core CPU and the 1920x1080 pixel FullHD display for starting at 1599 euro. That's about 200 euro more than the starter alternative with an i5 CPU and a lower hard disk capacity and RAM, and without BluRay. Naturally, a legitimate question turns up in the target group: Is the surcharge worth it also in view of performance and image quality? We've tested the latest model and will try to answer these questions. 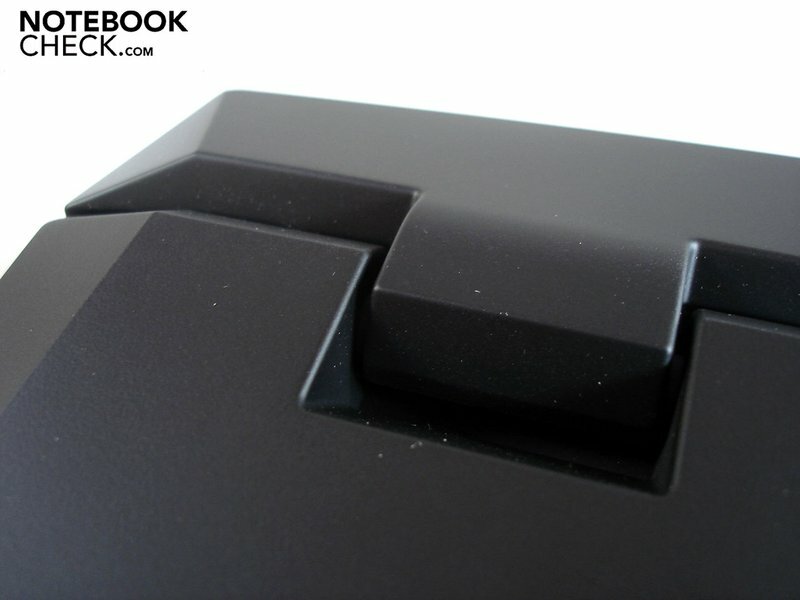 Issues like the case, the connectivity and input devices won't be dealt with. 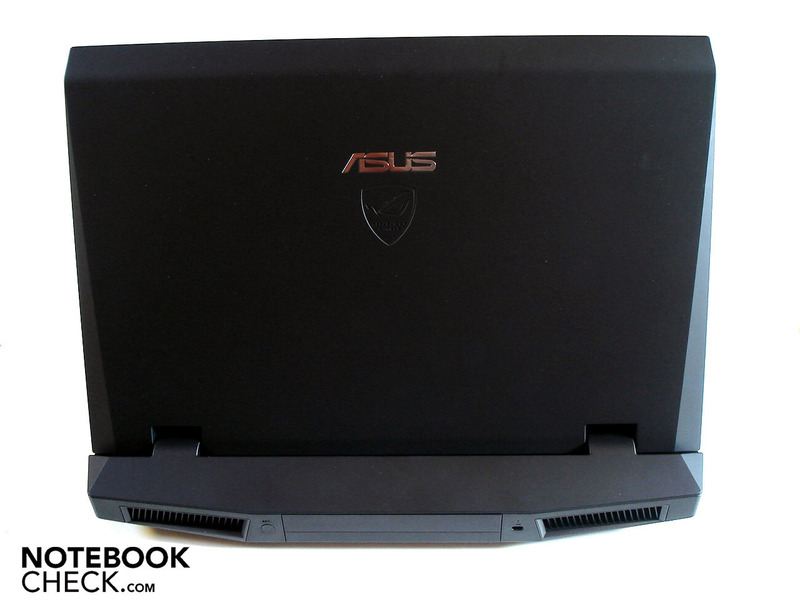 Detailed information about that can be found in our review of the identically constructed Asus G73JH-TY042V. The majority of pictures of this review also originates from the previous review. We'll start our review update with the new display. 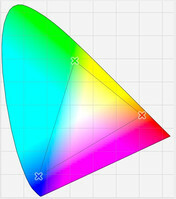 The FullHD Color Shine (glare-type) Display, as Asus calls it, now has a maximum resolution of 1920x1080 pixels. On the one side, this provides a plus of overview on the display, the possibility of rendering HD content in the native FullHD resolution - whereby even the integrated BluRay drive really comes to bear, and the maximum possible image quality of computer games, in comparison to the first G73JH alternative's HD+ display. Therewith, one critique point of the first G73JH configuration line has been eliminated. But what do the new screen's measuring specs look like? We could measure a maximum luminosity of 197 cd/m2 in the upper center display area. This is a considerable step back in comparison to the 241 cd/m2 of the HD+ screen. However, that's not it yet: Even the average brightness of 183.85 cd/m2 and the illumination of 87.5% are under the level of the display with 1600x900. The utilized screen (HSD173PUW1) can baffle with the given image contrast. The screen manages a record-breaking maximum contrast of 1023:1 with an extremely low black value of only 0.17 cd/m2, despite the low brightness. Subjectively, the sharp image is pleasing with crisp colors and a saturated black. 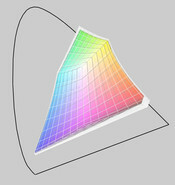 The excellent image contrast is also noticed in games. 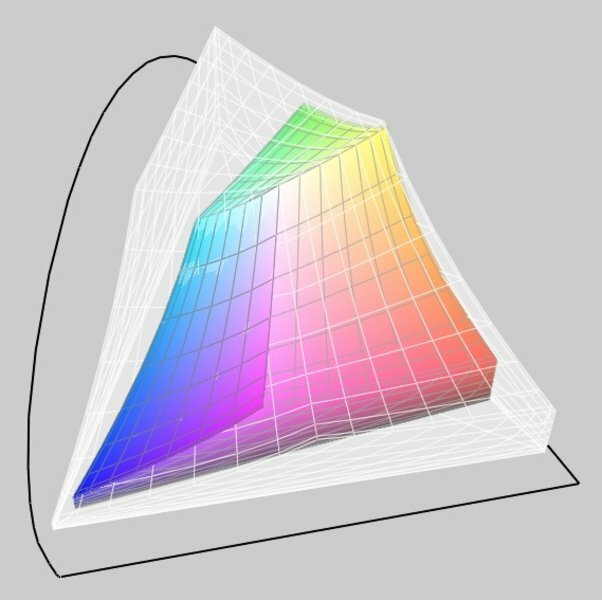 The measurement of the representable color space taken with our Spyder 3 Elite tool classifies the used display as a wide gamut screen, comparable to that in Acer's Aspire 8943G. The RGB color space can almost be covered completely. The screen remains to be inferior in comparison to RGB displays, such as in Dell's Studio XPS 16, though. The display's reflective surface has remained, which can cause annoying reflection in unfavorable ambient lighting conditions. This is usually insignificant in dimmer interiors, but, that could already be enough for unpleasant reflections when you sit next to a sunny window. Gamers with a spleen for matt displays will however have difficulties to even find appropriate models. Of course, it's possible to connect an external monitor alternately, which we tested with a Dell 2408Wfp. The HDMI port supplied a perfect picture, as expected. If you want to continue to enjoy the sound from the integrated boxes, you will have to set that up in the audio options since audio data is transmitted via the HDMI cable standardly. The viewing angle stability turns out overall a bit more extensive than that of the HD+ display. Thus, the screen also forgives even slight deviations on the vertical plane. 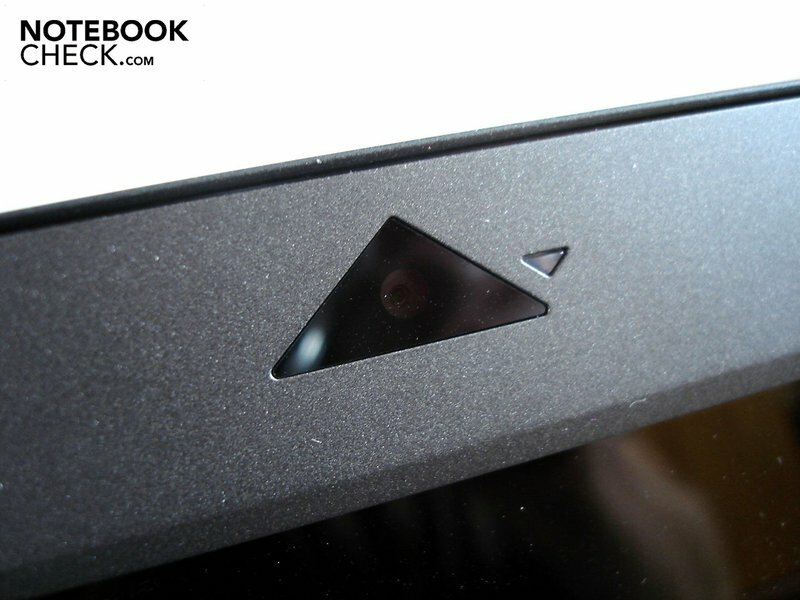 Even flatter viewing angles are possible along the horizontal viewing axis. Primarily, reflections that turn up at too flat viewing angles are the restricting factor. Let's now continue with the performance part, as especially the upgrade of the CPU, RAM and built-in mass memory are a significant part of the newly laced gaming package. The most alluring modification for gamers is most likely the utilization of an Intel Core i7-720QM quad-core CPU, which tethers a high clock rate of single cores (up to 2.8 GHz) with the possible advantage of several cores (with up to 8 threads in sync due to hyperthreading). Looking at Intel's price design, the upgrade from a i5-520M to i7-720QM chip costs exactly 139 dollars. That's how much the current price difference of both processors is when 1000 units are bought. If the other technical data of the CPUs are compared, 2.4-2.93 GHz speak for the 520M chip in opposition to 1.6-2.8 GHz in the 720QM. Nevertheless, the dual-core is again inferior, with a L2/L3 cache of 512/3072KB, to the quad-core (1024/6144KB). Ultimately, this also applies to the maximum power consumption of 45W vs. 32 W. There haven't been any changes in the graphic card. 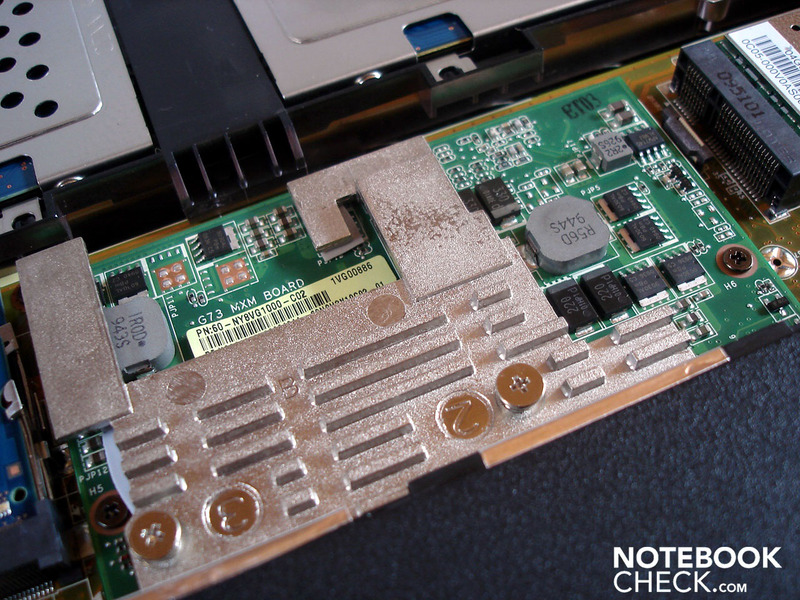 An ATI Mobility Radeon HD5870 GPU with a 1024MB GDDR5 video memory still does its job in the Asus G72JH. 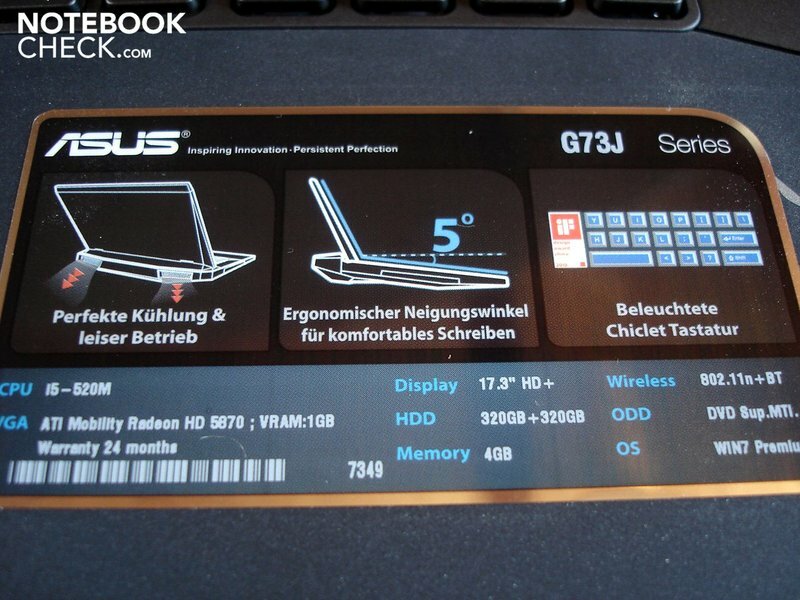 The G73JH version with a quad-core CPU at hand also has the "Twin Turbo Mode" of Asus' Power4Gear software. We couldn't observe an impact on the CPU clock rate in opposition to the dual-core alternative, though. Even according benchmark tests didn't show any noteworthy differences. In view of performance reserves, a range of benchmarks for comparing the i5 dual and i7 quad-core CPU can be referred to. 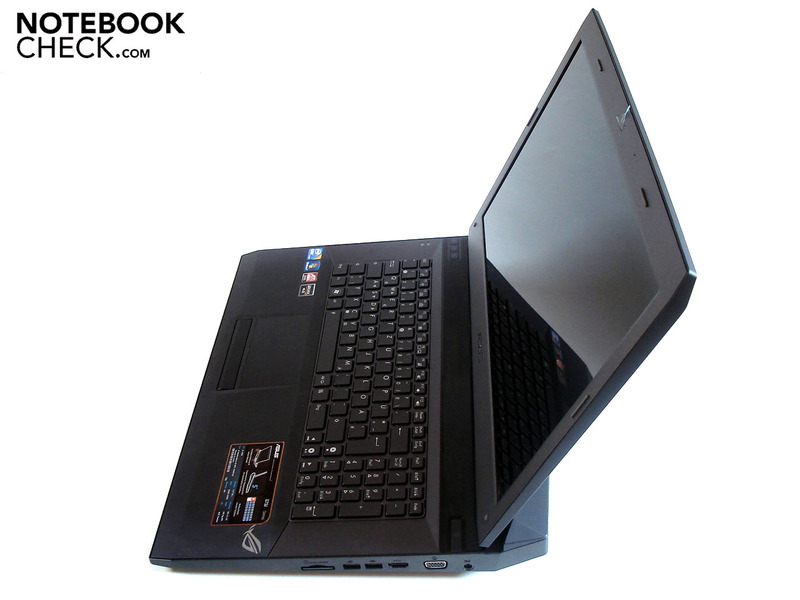 The current G73JH can, for example, reach 3174 points in 3DMark06 and is thus in the leading group of comparably equipped notebooks. The 520M CPU's best results are in a field of 2800 points. 2741 points could be achieved with an accordingly equipped G73JH-TY042V. The Cinebench benchmark test compares the chip's performance at rendering images with assistance of all available cores, respectively threads. Whilst the i5-520M CPU is still well in the race with 3957 points to 3952 points for the 720QM CPU, the i7 quad-core CPU pulls away with a full 10148 points to 8162 points. The multi-core's potential becomes very obvious here; however this has to be supported accordingly by the individual application. This naturally also applies just as much for games. For further detailed information about the CPU, visit our CPU benchmark list. The PCMark Vantage benchmark test, which classifies the overall system performance, turns out to be a bit surprising. The expensive quad-version remains considerably behind the dual-core variant (6726 points) of the G73JH with 6392 points. The communications test suite that supplies a strikingly worse result proves to be responsible for that, to be precise. As to the gaming performance of the device at hand, you can already make a preliminary hardware classification with the widely distributed 3DMark. The G73JH with the 720QM achieves 17928 points in 3DMark2005, which are a bit less than 500 points of the i5-520M CPU alternative (18396). The higher clock rate under utilization of single cores in the dual-core CPU likely plays a role in this. The tide then already turns in the more current 3DMark2006 and the G73JH quad-core alternative can leave the dual-core variant (12356 points) behind with 12802 points. The quad-core system's advantage becomes even clearer in the 3DMark Vantage benchmark test. 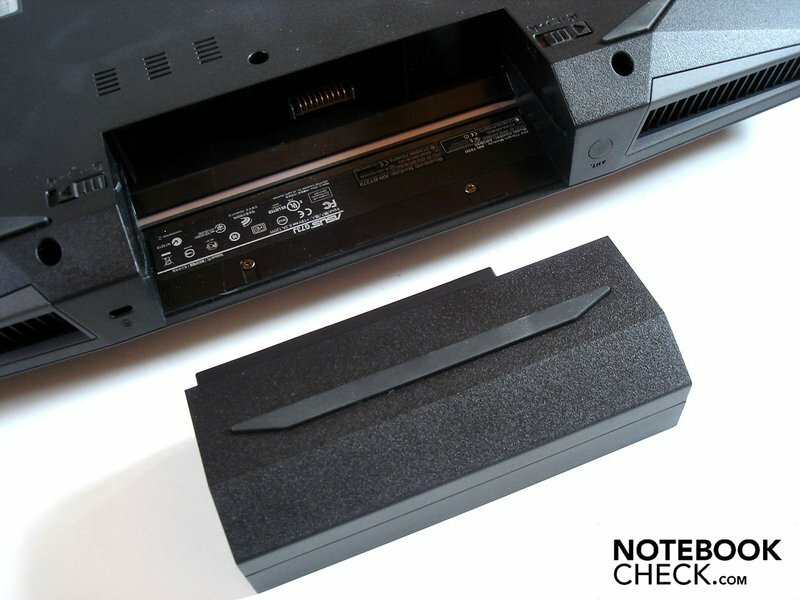 The G73JH-TZ014V places itself in the front field of similarly equipped notebooks with 8044 points. The i5-520M version does already lag behind by about 7% with 7462 points. The combination of two powerful Seagate mass memory units (ST9500420AS), each with a capacity of 500GB and a rotation speed of 7200 rpm, don't only provide an excellent gross capacity of one terabyte, but this hardware can also score in terms of velocity. The hard disk is in the top range of common hard disks with an average transfer rate of 81 MB/s and can only be topped decisively by RAID systems and SSDs. The access rate of 17.5 milliseconds is also okay. As usual, we test the gaming performance with a selection of current games. 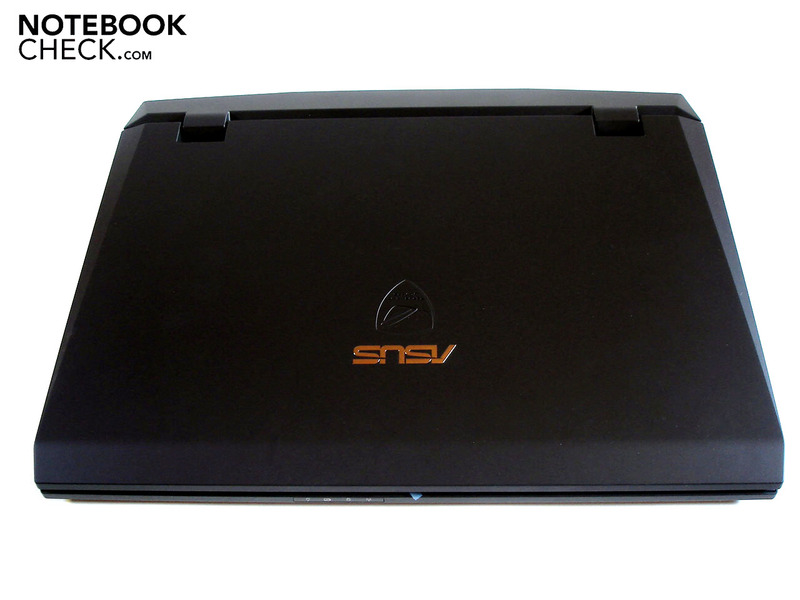 It's interesting, where the gaming notebook is in comparison to other manufacturers' machines. 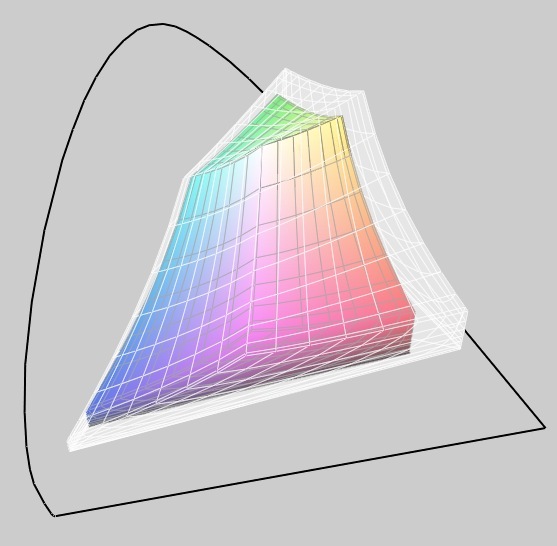 A direct comparison to the not as expensively equipped Asus G73JH-TY042V is insofar difficult, as the used FHD display doesn't support a resolution of 1600x900 pixels and thus, the settings of the previous model can't be reconstructed. You can take a shot at the highest graphic settings even in CoD:MW2 with accordingly strong hardware onboard. We have chosen our standard setting for this performance class, which is all options on, or to the maximum, as well as 4xAA. The resolution remains at the native 1920x1080 pixels. We could record an average frame rate of 48.7 fps in these settings at insinuating the first single player mission. In comparison, the MSI GX740 achieves a bit more with the same graphic card and CPU (51.1 fps). The frame rate mainly stays in the field above 30 fps in these settings. However, there is also a plunge down to 20 fps to be observed. The G73JH with the 520M CPU achieves an average of 55.4 fps in comparison, but in a considerably lower resolution of 1600x900 pixels. Experience has shown that BC2 presents itself as a bit resource demanding. Nevertheless, we chose the highest settings with no mercy here, too (details to very high, HBAO on, 4xAA/8xAF). Our benchmark runthrough (intro of the first single player campaign) brought an average of 32.7 fps. The Asus G73JH places itself in front of the similarly equipped MSI GX740 (720QM/HD5870) and is only beaten by the Devil 9700 DTX with a somewhat stronger 820QM CPU with 33.1 fps. The frame rate mainly hangs in between 30 and 40 frames, but can sometimes plunge down to 10 fps. This leads to disturbing stutters without fail in the game play. 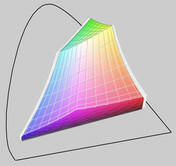 The G73 scores similar in the dual-core alternative. 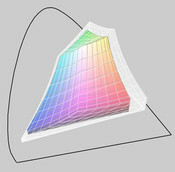 Although it had been tested in a lower resolution (HD+), the frame rate takes a similar course, including breakdowns to a similarly critical level. In order not to only use the hardware demanding shooter genre, we also picked up a strong representative of race simulations with Dirt 2. Additionally, the game also supports DirectX11 in the according settings. The game integrated benchmark test certifies the Asus G73 an average frame rate of 29.5 fps in the highest settings (very high presets, 4xAA, Full-HD). Thus, the Asus G73 lags a bit behind comparably equipped colleagues, for instance the Devil 9700 DTX (30.9 fps) and the MSI GX740 (33.8 fps). 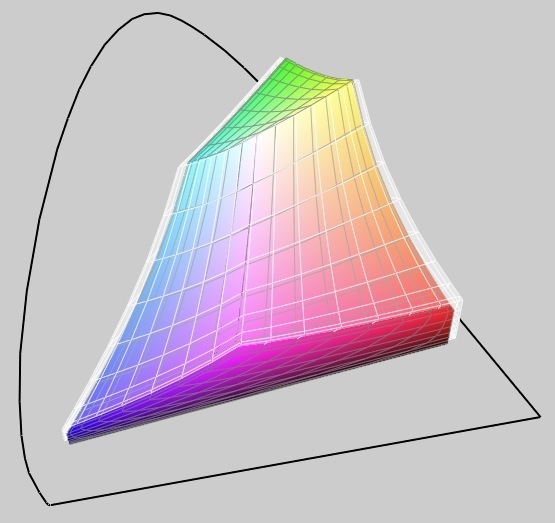 The recorded frame rate remains steadily around 30 fps, which is expressed in a consistently smooth image sequence. The G73JH-TY042V achieves a marginally better result in the otherwise same settings with an average of 31.9 fps in 1600x900 pixels. The last test track is also counted to the simulation genre and comes from the Need for Speed saga. Our test round on the London course showed a convincing 43.3 fps on average with high graphic requirements (1920x1080 pixels, high details, 4xAA). Therewith, even the somewhat more powerfully equipped Devil 9700 DTX can be caught up to. Once again, you may take delight in a very constant frame rate, which also is usually above the 40 fps mark and therefore grants a smooth game play. The G73JH with the 520M dual-core processor can't really break away with 43 fps despite a low HD+ resolution (1600x900). The quad-core configuration is likely responsible for a certain advantage here. 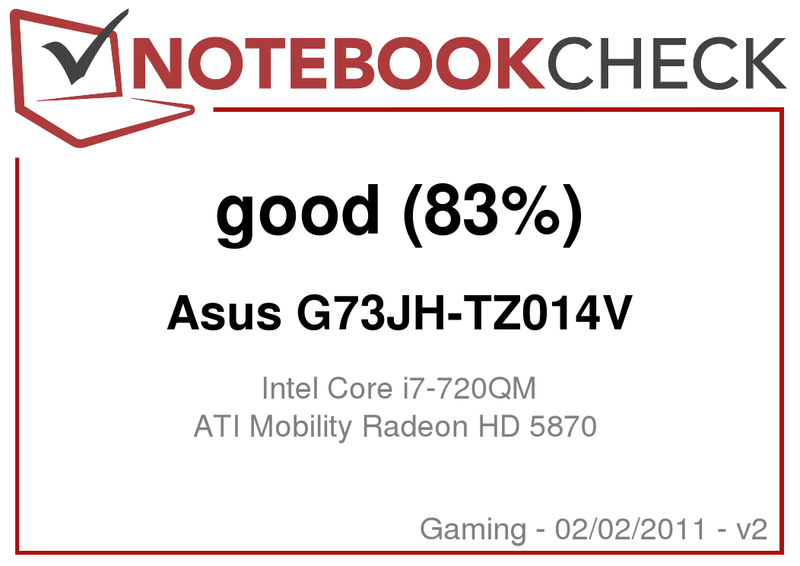 Verdict: As already so often, you have to conclude for the Asus G73JH that it strongly depends on the single application or rather game how much impact the CPU has. Fact is that older games sooner benefit from the less higher clocked cores, whilst newer games are relying more and more on multi-core architecture and a performance gain can be achieved with that. 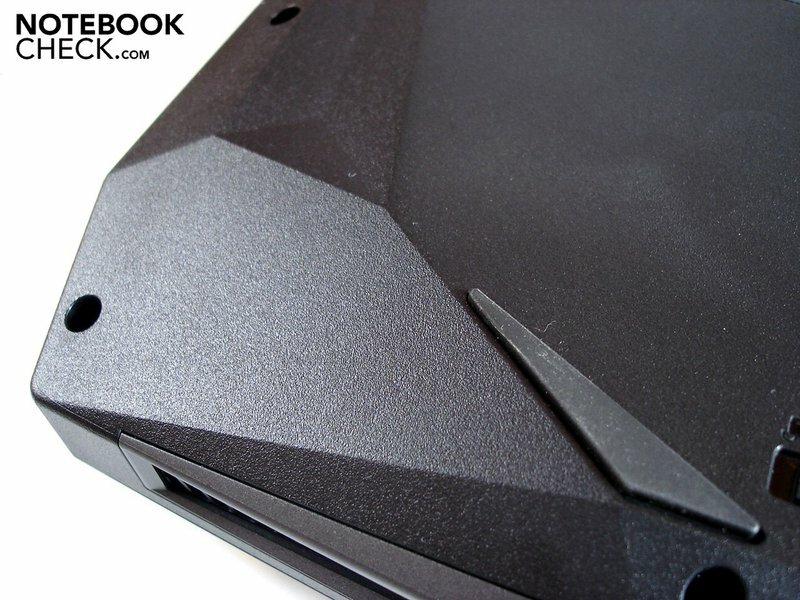 The Asus G73JH-TY042V already had a reputation for being an especially quiet gaming notebook in the first test. Asus' statement about the case being especially tuned to an optimal cooling effect can only be underlined with that. 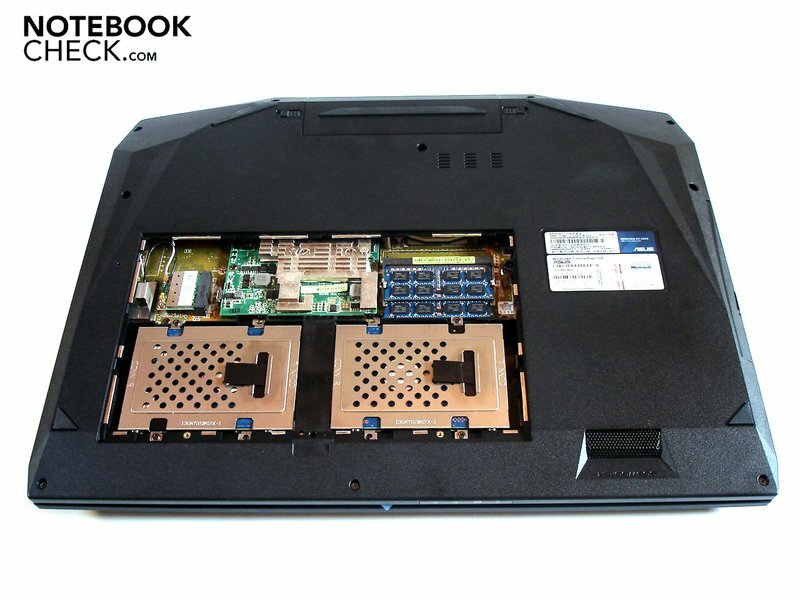 The cooling load increases with the quad-core CPU as the Intel Core i7-720QM, with 45W, has a 10W higher cooling requirement than the i5-520M dual-core chip. Naturally, deviating emissions can turn up due to the different configurations in view of RAM and hard disk. 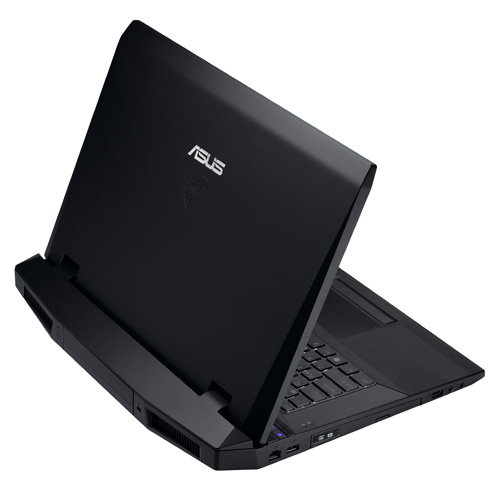 Nevertheless, the G73JH again stays exceptionally quiet in idle mode or in light office load, such as internet surfing, writing texts, etc, with 34.2 dB(A), even if slightly above the level of the dual-core alternative. Subjectively, the quiet background noise is still easy to cope with, even for sensitive ears. The noise level increases to a maximum of 41.3 dB(A) in the stress test (Furmark+Prime95) and is still in an absolutely uncritical field. The noise level on our measuring scale falls even below this rate in practical gaming load: 39.3 dB(A). 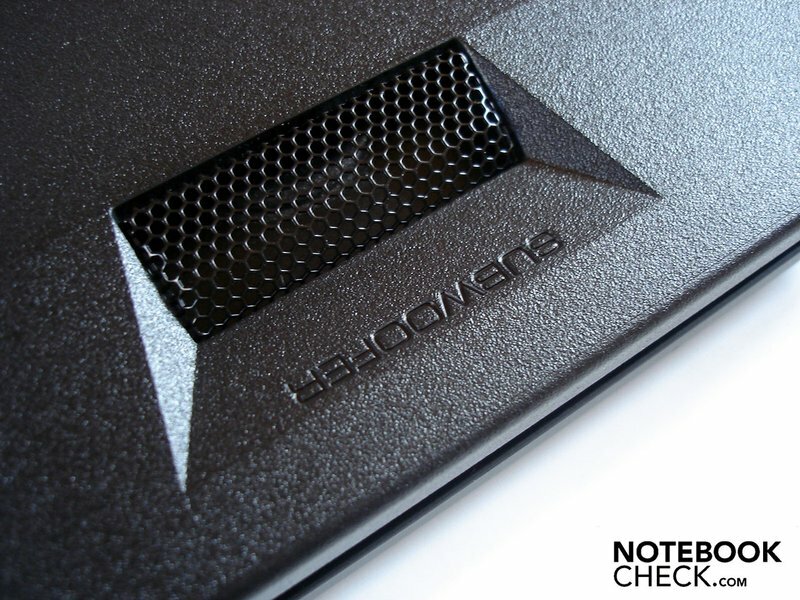 Both measuring points are actually a bit over the G73JH-TY042V variant's level, but are in the absolute top class in comparison to many other gaming notebooks. A slight increase in the measured rates isn't only recorded in regards to system noise, but also the observed surface temperatures turn out a bit higher. The case stays on both the upper and bottom side pleasantly tempered in idle mode and reaches a maximum temperature of merely 32.6°C. The temperatures climbed to a maximum of 42.6°C on the upper side and 44.0°C on the base unit's bottom in the stress test of several hours under load of the CPU and GPU. Overall, a notable, measureable temperature increase in all operating states can be observed in comparison to the dual-core alternative. Nevertheless, the level still stays in an unproblematic field. 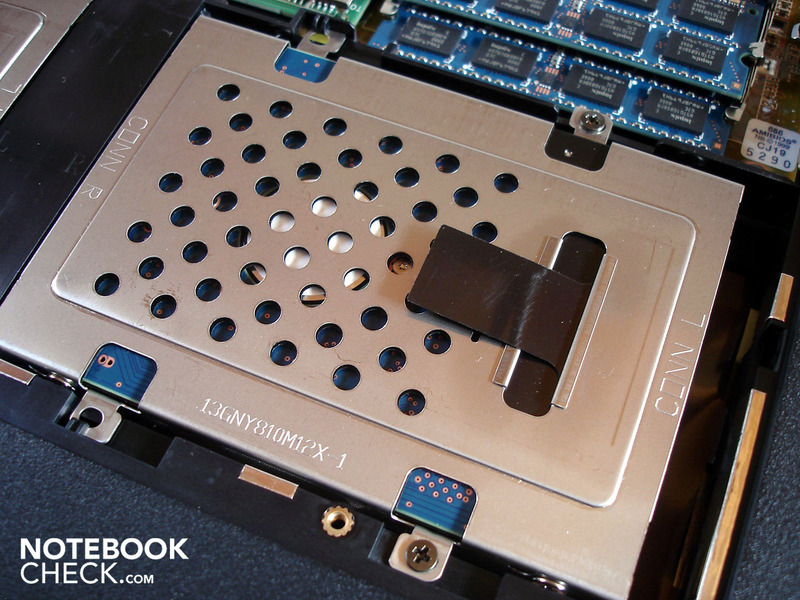 If the temperature development of the components inside are observed, a maximum temperature of up to 80°C in the CPU and up to 93°C in the GPU are recorded. The processor temperature settles to about 70°C in the long term, whilst the graphic chip sways between 85°C and 92°C. 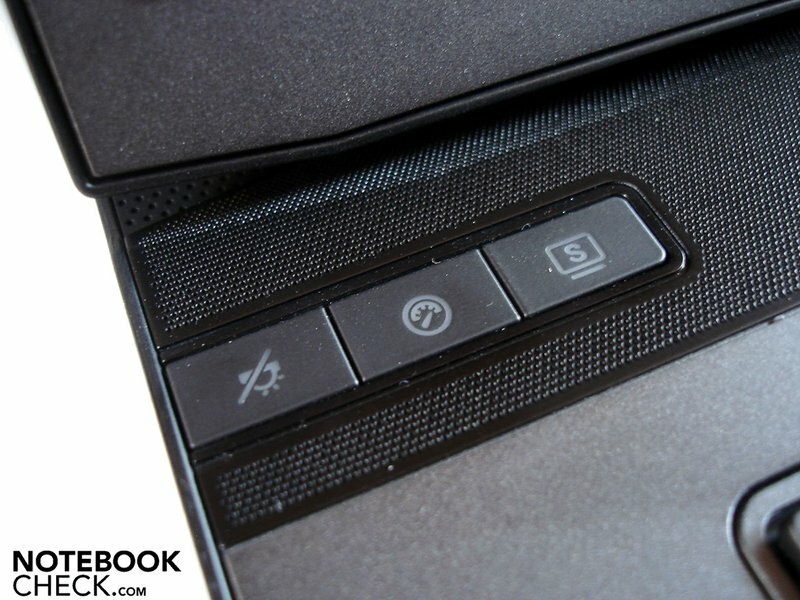 (+) The palmrests and touchpad are reaching skin temperature as a maximum (35.1 °C / 95.2 F) and are therefore not hot. (-) The average temperature of the palmrest area of similar devices was 28.7 °C / 83.7 F (-6.4 °C / -11.5 F). 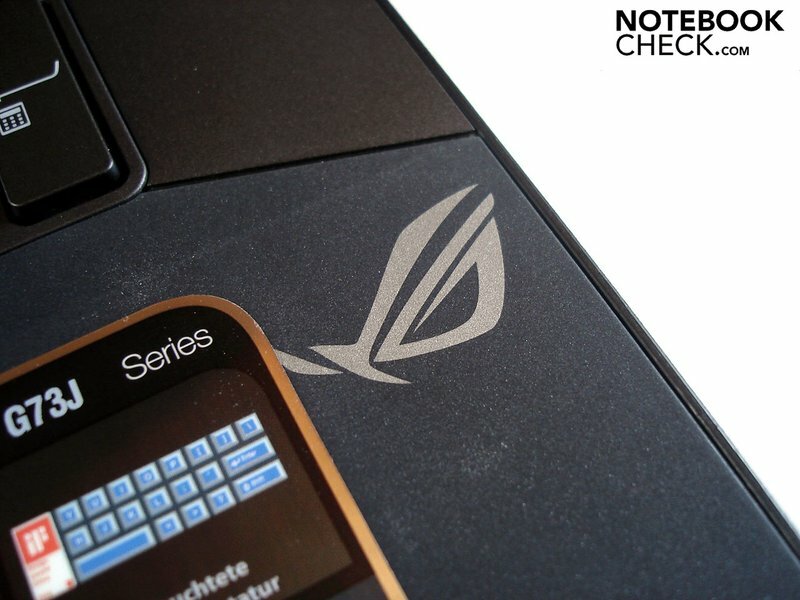 There aren't any differences to the already tested Asus G73JH model, so we would once again refer to previous review here. 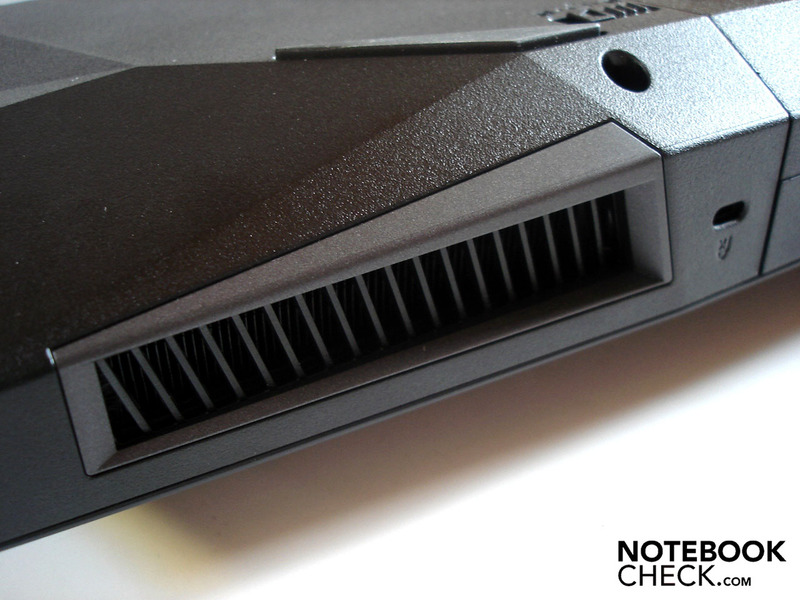 If there is a thing that can soonest be ignored in a high-performance gamer, it's probably the battery life. 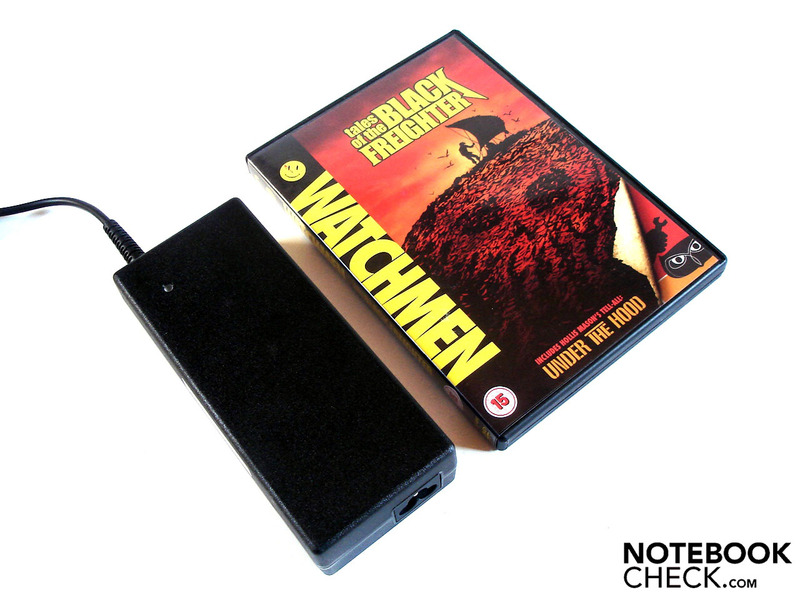 The notebook only achieves about 2h in the close to reality WLAN surf mode in its "small" configuration, which is at best a feasible emergency mains independency. It seems obvious that this result won't get better with an accordingly strong CPU. The power consumption measurement in idle mode shows an energy consumption of 38.2 to 54.4 watts. 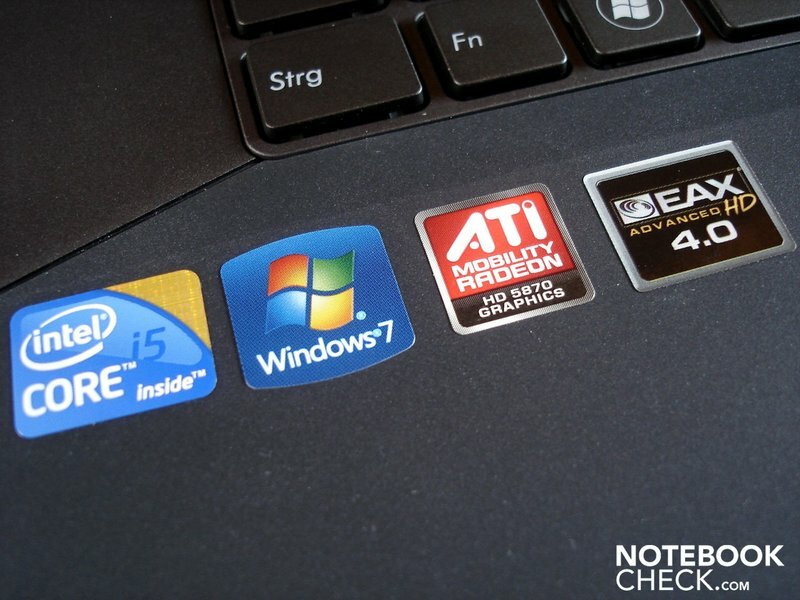 That is consistently slightly to a lot more than in the dual-core laptop alternative. The difference is even greater under load, and the G73JH treats itself to almost the complete potential of the 150W adapter with 145.2 W in the stress test. However, it doesn't indicate any overload tendencies with a maximum temperature of 51.8°C. The integrated battery only lasted for 54 minutes under load in the battery runtime test (BatteryEater Classic test - max. 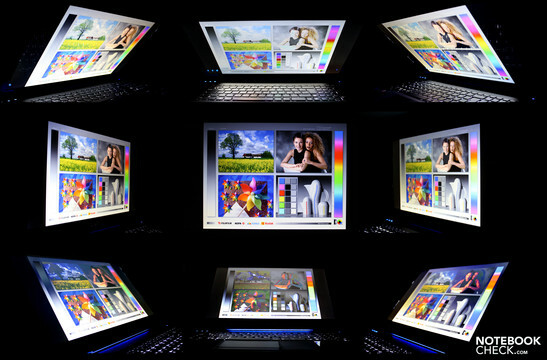 display brightness, high performance profile). That's about 15 minutes less than the G73JH dual-core alternative. Both G73JH alternatives with an Intel Core i5-520M, respectively i7-720QM are very similar in the core competency that is the performance in current games. The single application or game ultimately decides if you can sooner benefit from the multi-core architecture or from a slightly higher core clock rate instead. The quad-core CPU is to be favored in the very latest games, because this technology is constantly experiencing a growing support in current and upcoming software. You can certainly argue about the feasibility of an 8GB RAM in gaming scenarios. But because there are four memory banks available and Asus successively uses 4x2GB modules, the price for it is comparably low. 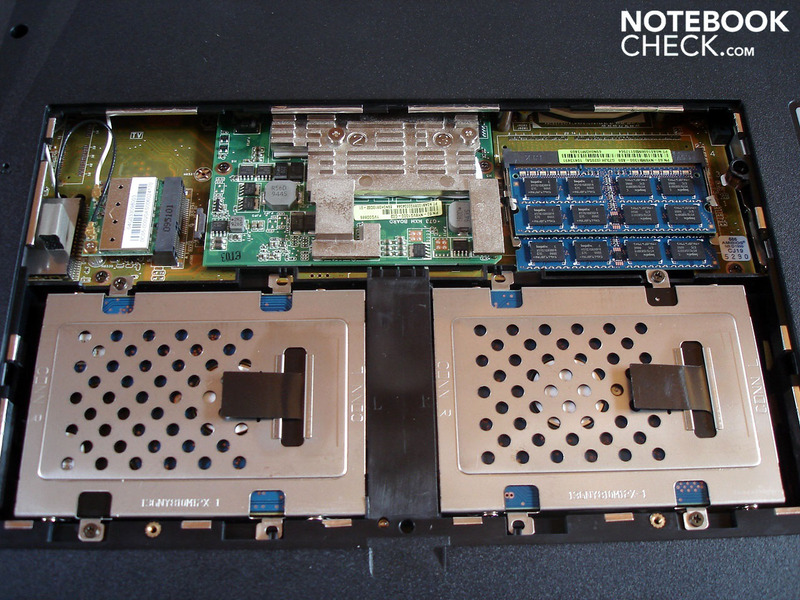 The BluRay drive and the FullHD display is, without a doubt, a configuration upgrade. We would have hoped for a somewhat brighter screen though, despite the excellent image contrast of more than 1000:1. 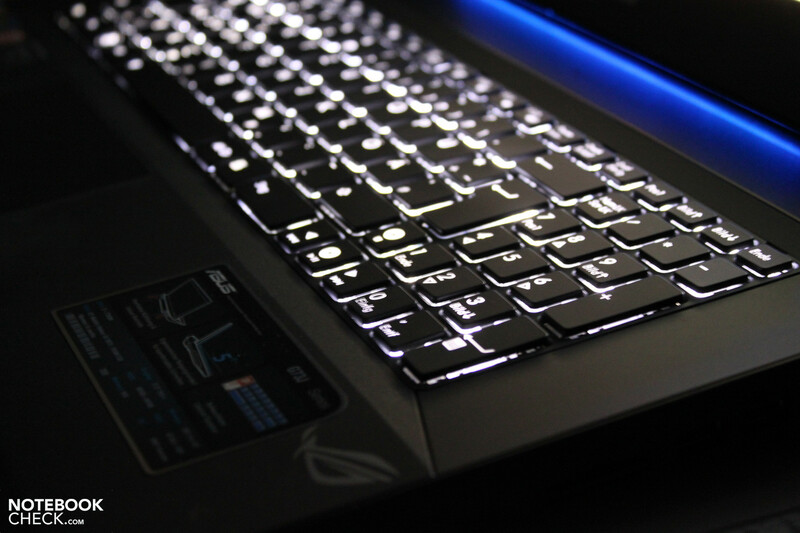 The main argument for the G73JH still is the combination of first-class gaming performance and a pleasant system noise level, which remains agreeably discreet in the background even while surfing on the internet or rendering movies. This is an issue where many gaming alternatives often fail. 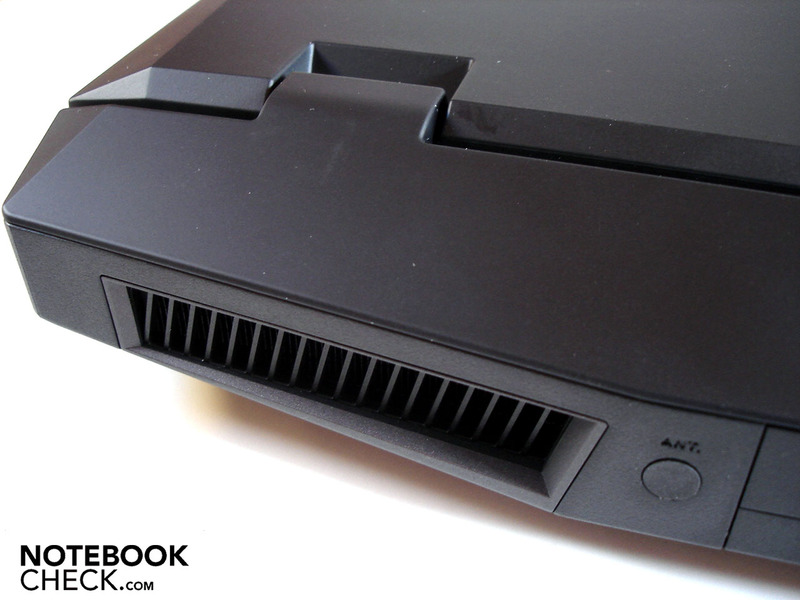 As before, the excellent cooling concept by Asus, which manages even the currently strongest graphic card and a strong quad-core CPU easily. A FullHD display is a good approach to start with, the great given contrast is convincing. But a few more candelas of brightness wouldn't have hurt the screen. That it took so long before Asus developed a throughout convincing mobile gamer.